In Simpson’s view, twentieth-century equilibrium economics has distorted the main mission of the profession—to understand the processes of change and complexity in economic life. Contemporary economic theory, Simpson contends, models the economy as a system tending toward equilibrium, a model borrowed from classical (pre-relativity and pre-quantum) physics. Instead, Simpson shows, the economy is dynamic, complex, and never in equilibrium. The heart of Simpson’s analysis is his engagement with complexity theory. Briefly put, complexity theory posits that the actions of multiple actors give rise to emergent, large-scale structures and processes. Complex systems have five major attributes. They are dynamic and nonlinear; individual agents within such systems learn adaptively over time; agents interact with each other explicitly and directly; macro patterns emerge from a multitude of micro interactions between many agents; and, complex systems evolve through processes of differentiation, selection, and amplification. Thus, in Simpson’s view, the economy has more in common with biological systems than classical physics. While others, like Brian Arthur, view the economy in much the same way, Simpson makes two important and novel contributions. First, as his title suggests, complexity economics is not new. It was how 19th century economists (at least up to Marshall) thought the economy worked. And the insights of complexity economics bear a striking resemblance to some of the work of the Austrian school. Second, Simpson argues for a renewed embrace of history and context over mathematical formalism. Simpson takes as a telling example the 2008 financial crisis and subsequent near-depression that occurred, despite that most equilibrium economists thought that panics and depressions were things of the past, having been mastered by Keynesianism and the Efficient Market Hypothesis in turn. This book distills Simpson’s career in economics spanning nearly 40 years. Simpson has served in academia, industry, and government, giving him a unique and broad perspective on the theory and practice of economics. It is perceptive, thought-provoking, and engagingly written. It will be a welcome addition to the libraries of anyone interested in the history of economic thought as well as the roots of our current economic crisis. In this blog series, Yuan Yang writes about her encounters with the Greek Parliament’s feminist economists. 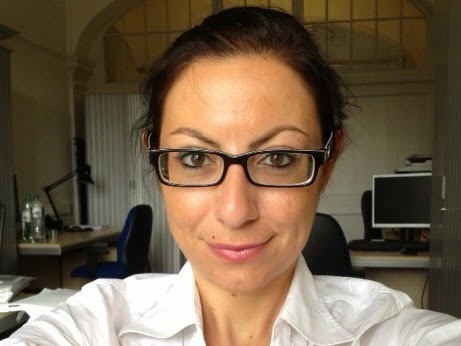 This week, she describes the political and academic origins of Antigone Lyberaki and Rania Antonopoulos. When there are so few critical economists in politics–and so few women–it is emboldening to meet two feminist economists in one place: the Greek Parliament. Antigone Lyberaki is from the centrist party To Potami (The River), and Rania Antonopoulos is from the left coalition SYRIZA. Both were recently elected in the stunning January 2015 elections, which saw SYRIZA claim 149 seats (one short of an absolute majority), and brought several smaller parties, such as To Potami, into Parliament. Antigone Lyberaki is a feminist economist who has written extensively on economic policy, and used to lecture at the University of Panteion in Athens. She offered to meet me at the door of the Airbnb apartment I was staying at in the university district of Panepistimou. As I emerged, she smiled at me and looked at the front door curiously. “How did you find this place?” she asks, and I explain that it was via a website. 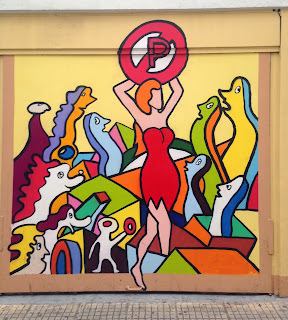 “When I was a student – forty years ago – I used to come here several times a week, every week, for meetings of the pro-European Communist Party of Greece.” “This very door?” “Yes, this very door, on the first floor. We had a party magazine, we had debates, we had meetings." The rooms on the first floor are now padlocked and barricaded with chains. “Have your political views changed since university?” I ask Antigone. “I no longer believe in the abolition of private property,” she replies, “But I do believe in the overall goal: of a free and equal society.” Her methods have changed; not her objectives. She is attempting to achieve such egalitarian objectives through her position as To Potami’s parliamentary representative. Being a parliamentary representative means that Antigone has more opportunities to take the floor when she wants to intervene in parliamentary debate, that she gets a longer time limit, and that she can raise any political issue in parliament - regardless of the topic set for that day’s discussion. As a member of a small party, Antigone is kept on her feet. Rania Antonopoulos, now SYRIZA’s Alternate Minister for Labour, also became awake to politics as a student activist in the pro-European Greek Communist Party. “In 1974, when the Greek dictatorship ended, there was a moment of mass mobilisation,” Rania recalls. “The student movement rose up, particularly in the polytechnic universities. It was impossible not to be politicised. Like many fellow students, I joined the Youth Branch of the Communist Party of the Interior. Because of that, I started reading books about economics, such as Marx's Das Kapital. I felt Marx explained so much about my life; I became determined to understand the economy." Rania, too, describes the moment she realised she was almost certainly going to have a seat in Parliament, since she was placed second on the party list of MPs who would be automatically elected if SYRIZA won. “I suddenly thought to myself, I’ll need to book a flight,” she says, describing leaving her home in New York, where she has lived her whole adult life, to return to Athens. She had studied at the New School for Social Research, and before her return to Athens, was director of the Levy Institute’s research program on Gender Equality and the Economy. How, then, do they explain their unexpected elections? “It was the television interviews that did it for me,” says Antigone. “I reached many people, and I spoke clearly and frankly.” Has she had any training? “No training, not at all,” she says. “I’m used to giving lectures and classes, of course. I’m used to having a person in front of you, and you learn how to react to their facial expressions, when they’re getting bored or confused, when you need to slow down, speed up.” I think to myself of all the economics lecturers I’ve had who never seemed to realise they had a living audience. “After my first few interviews, my friends in the media would call me up and say, Antigone, you need to talk more slowly, you need to drop these words, you need to stop wearing that shirt with the stripes. I learned!" From remarkably similar backgrounds – left-wing student politics leading them into careers as academic economists – both Rania and Antigone have been drawn back into politics in a professional capacity. What happens when feminist economists stop writing about gender equality in labour markets and the financial crisis in academic journals, and starting writing policy? What does feminist economic policy look like, and do feminist economists always agree? Part 2 will follow on Sunday 31st May. TURIN. On the 28th of March, Rethinking Economics Italia took part in the organization of Biennale Democrazia, the prestigious cultural festival held every two years in Turin, with the aim of discussing and spreading a culture of democracy. For a period of five days, crowds of young and old people drowned the city, taking part in workshops, seminars, and debates on offer at the event, concerning democracy, pluralism, and sociological and economic issues. So, how could there not be an event arranged by RE Italia? Pluralism, in fact, has always been one of the fundamental principles on which the Italian democracy (together with those of most Western countries) was founded. The event was also a chance for the organizers of the newborn Rethinking Economics groups spread all over Italy to meet and discuss future projects. The participants came from the groups set up at LUISS University (Rome), Bocconi University (Milan), University of Bologna, University of Bergamo, University “Cattolica del Sacro Cuore” (Milan), plus members of the national group from the Universities of Genoa and of Pavia. Rethinking Economics Italia organised a debate - entitled The Limits of the Market - focusing on the market, its mode of operation, and its limits, with Colin Crouch (Emeritus Professor at Warwick University), Elena Granaglia (Professor of Social Justice and Markets at Roma Tre University), and Nicolò Fraccaroli, founder of RE Italia, as moderator. Given the political and sociological background of Crouch, and the philosophical and juridical one of Granaglia, the event was an interesting opportunity to deal with economics from an interdisciplinary perspective - interdisciplinarity being one of the three pluralisms proposed by the ISIPE manifesto. Both speakers agreed that the market cannot limit and auto-regulate itself because every player can influence the sphere of freedom of others, so everybody in the market employs a kind of power. Therefore, if the market is a confrontation of powers, it should be regulated. Elena Granaglia added that a competitive market is a political construction, and that there has to be an authority that defines its rules in order to create it. A market, therefore, is not a natural occurrence. The debate continued to address the supposed “trickle down” effect, and the role of economic research in addressing real political economic choices. Elena Granaglia said that in order to measure inequality, income, and in general important indexes, we have to define them, and different interpretations can have significant consequences for the results. It is therefore not possible to divide philosophical questions from those posed by the science of economics. Moreover, even research that seems to belong to some kind of “positive” economics, analysing things for what “they are", contains normative choices. The last question was more focused on the reform that Rethinking Economics is trying to enact. One of the chapters of Crouch’s latest book is titled We Are All (Partly) Neoliberals, explaining that a reaction to this (partial) society-wide homogeneity should come from pluralism in politics. Nicolò Fraccaroli asked Crouch whether this could come from pluralism in economic education too. Crouch agreed, clarifying that across centuries, scientific progress has proceeded toward a continuously deeper specialisation, shaping the new figures of the “experts” - the technocrats. But the deeper we go into specialisation, Crouch said, the more we lose the links between these specialisations. For Crouch, then, it is necessary to recover a multidisciplinary approach in economic teaching; economic research has also to consider contributions from other disciplines, in order to be able to explain the complexity of the real world. 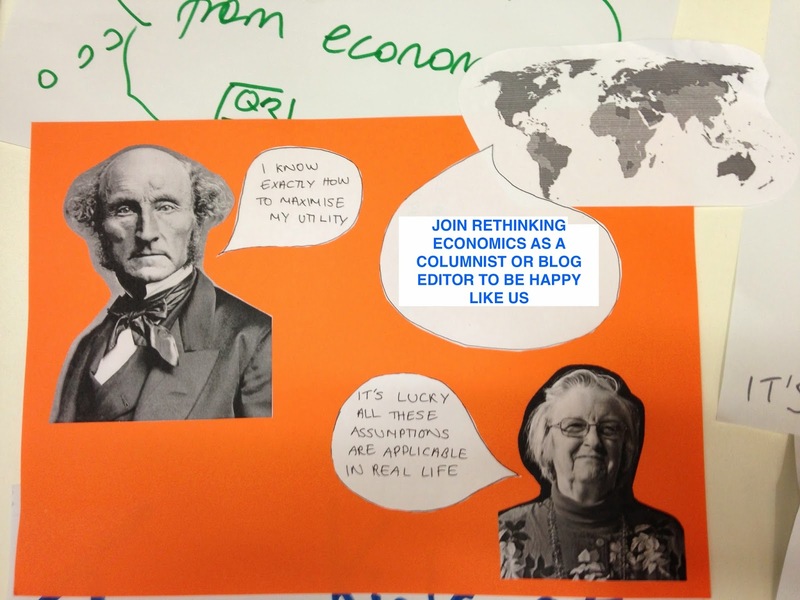 Rethinking Economics is looking for new blog columnists and editors! Apply by 28th March. Rethinking Economics is a young network of students and citizens. We have come together to call for a better, pluralist, more diverse economics. - News: to write, edit and communicate news, events and stories from our local groups around the world, to a wider audience. - Opinion: to write, edit and communicate book reviews, opinion pieces on different schools of economics, and analysis of economic news from a pluralist perspective. - Blog writers, to write news pieces and opinion pieces, based on news from Rethinking Economics’s own projects and local groups, or from current events, and conferences that you will be given access to via Rethinking Economics; to write for regular columns, such as “Meet the Rethinkers” (interviews with our current organisers and supporters). You may apply for one or both roles. - attach a max. 300 word piece on EITHER an area of RE’s work or vision that you think is under-communicated; OR an opinion piece on news that you believe RE ought to write on. - include a brief statement of how much time you will be able to dedicate regularly per week. - Specify what time zone you’re in and what times work for a Skype call - we’ll arrange to have a chat with you in the week of Mon 30 March - Sun 5 April. The 24th of November was an important day for the economists at the University of Greenwich, when four programmes in economics offered by the Department of International Business and Economics - BSc (Hons) Economics, BSc (Hons) Economics with Banking, BA (Hons) Business Economics and BA (Hons) Economics with Language - were successfully reviewed. Every day all over the country undergraduate programmes get reviewed and revalidated, so normally this is not something worth making too much fuss about. But this time is different! Our revised programmes are different. Why so, you may ask? The revised programmes were commended for “the enthusiasm and development of new material by the teaching team, showing a flexible and responsive approach to the current environment, as well as taking a leading role in the sector”. That is, they were praised for leading changes in the way economics is taught. The last seven years have not been easy for the global economy as well as the teaching of economics. The recent financial crisis and the Great Recession have led many economists, non-economists and students in economics to question the state of the discipline, wondering to what extent it provides the necessary tools to interpret the complex world we live in, signalling a deep dissatisfaction with economists’ ability to provide solutions to real world problems. Employers have recognised that the economics graduates that the standard curriculum generates are not equipped with the skills that the real world requires. Likewise, students themselves have recognised that the tools and theories they learn don’t enable them to make sense of the world they live in, let alone to address and solve real world problems. The need for a pluralistic approach to the teaching of economics, the need to teach real world economics that better helps to understand and act in the world we live in, the urgency to integrate some of the burning issues of our time such as ecological sustainability to the curriculum all emerged from the debate as crucial aspects. We are grateful to Rethinking Economics, International Student Initiative for Pluralism in Economics, and Post-Crash Economics Societies in Manchester and elsewhere for stimulating our debate. - Address socially relevant economic questions in all core economic courses by adopting a historical and pluralistic perspective right from the start and throughout the programme. - Add two new compulsory courses -Economic History in the first year and History of Economic Thought in the second year, and an optional course Political Economy of International Development and Finance in the third year. - Integrate the concept of environmental and social sustainability –– in the teaching of economics in all courses, as well as provide specific courses such as Environmental Economics and Environmental Regulation and Business Ethics and Corporate Social Responsibility. - Eliminate from the curriculum those topics that tend to be taught by default just because they appear on standard economics textbooks rather than because they are recognised as truly useful in understanding how economies really work. In particular, the rationale for the introduction of Economic History and History of Economic Thought courses is that students should be made aware of what has happened in the sphere of economics, more or less in the order that it happened. This will help them place the economic ideas and theories they come across in all courses into an historical context, to form their own opinion by reading the original texts, e.g. by Smith, Ricardo, Marx, Schumpeter, and Keynes, and hopefully develop an understanding of economics as the result of a dynamic social process including controversy, conflict, and social change. Our understanding of pluralism does not only include different schools of thought and disciplines, but also methodologies. Our new programmes encourage going beyond Quantitative Methods. We encourage the use of case studies, qualitative research methods, as well as a multitude of different quantitative methods including but not limited to econometrics. E.g. we pride ourselves for having the biggest research centre in Social Network Analysis (SNA) in Europe, and I, among others, use the approach and methodology of SNA in teaching economics. The ability to think critically also requires the ability to analyse empirical evidence, and this is why we have restructured our Quantitative Methods courses to strengthen students’ ability to identify, access and use relevant data sources to analyse current economic problems and form an independent opinion in the public debate, and to be critical about the way data is supplied and used. Finally, we care about developing the ability of our students to communicate economic ideas clearly and in a non-technical fashion to a wide variety of audiences, because economics should not be a cryptic language accessible only to an elite group of economists, but rather belong to the society. All in all we have tried to contribute towards a better teaching, learning and use of economics, and we hope to see more of this in the future, around the country and the world. © Rethinking Economics. Simple theme. Powered by Blogger.